Stories Behind Kinabalu Tremor – footsteps…….. This post is a compilation of stories related by victims as they post it on the internet. A powerful magnitude-6.0 earthquake has struck near Malaysia’s Mount Kinabalu on Borneo, cracking roads and buildings in the region and injuring climbers on the popular peak. “We had just completed the ascent to the peak, and [we were] making our descent, taking some photos when we heard a loud crash, and felt the ground shaking,” Vee Jin Dumlao, a clinical psychologist from Sydney, told the ABC. READ MORE…..
KUALA LUMPUR, Malaysia (AP) — Rescuers on Malaysia’s highest peak on Sunday searched for six climbers after recovering 13 dead from a strong earthquake that had trapped scores of trekkers. One survivor said she waited for a rescue helicopter that never came. 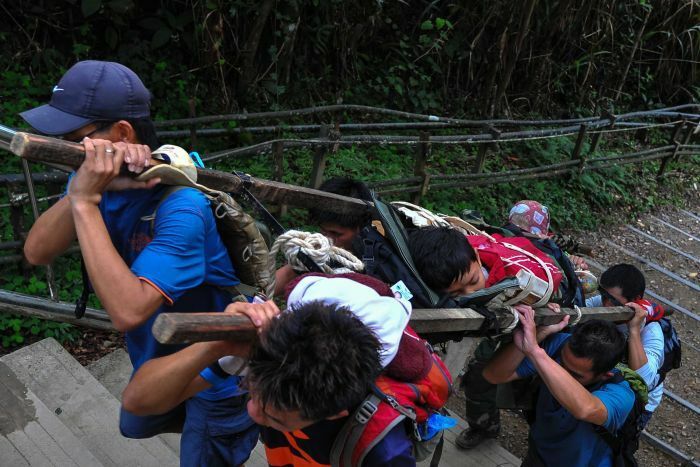 In the aftermath of the quake that shook Mt Kinabalu, these local heroes came to the rescue, assisting the stranded and weakened climbers back to safety amidst the damaged trail and in the darkness. 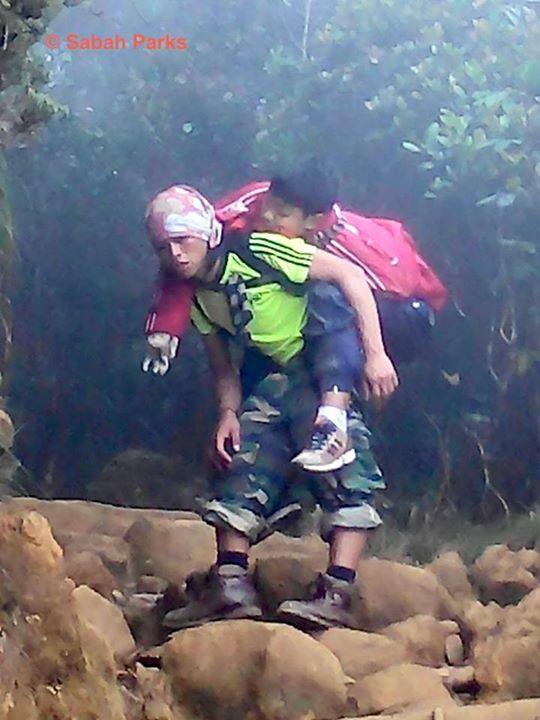 The photo of mountain guide Rizuan Kauhinin, posted on Sabah Park’s Facebook page, has garnered over 9,000 Likes and 890 shares after three hours. Rizuan Kauhinin was later also photographed as one of six people carrying a stretcher with a Singaporean boy who had sustained a shoulder injury. An amateur video clip on site went viral and appeared on You tube and many social media sites. THIS BLOG EXPRESS CONDOLENCE TO THE FAMILY AND NEXT OF KIN WHOSE THEIR LOVED ONES PERISHED DURING THE MOUNT KINABALU EARTHQUAKE. THIS BLOGGER ALSO EXPRESS HIGHEST APPRECIATION TO ALL THOSE WHO ARE INVOLVED IN THE SEARCH AND RESCUE EFFORTS AND ESPECIALLY THE THE MOUNTAIN GUIDES.